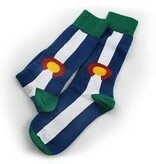 Not your grandfather's socks, these super soft Colorado Flag socks will be a favorite when worn with sandals or shoes. The colors are warm red, light navy, green, gold and off-white to create a vintage look. This is a cotton blend sock that is super soft. The shaped sock comes in two sizes, M and L. Medium fits up to a size 9.5 men's and large fits from a men's size 10 up to 13.